WHEN THE BEST TIME OF THE YEAR BECOMES THE WORST, BY NETA NER memories, loneliness, financial troubles and the year's disappointments can also cast a dark shadow over all the festivities. But even when the best time of year becomes the worst, there is hope. Three readers share their experiences and advice. THE QUIET GOT ME "Last December was particularly bad for me," says Anne Francis*, a medical doctor. As I am bipolar 1, I'm usually mildly hypomanic and highly functional. However, over the December period everything slowed down. I wasn't as busy and started experiencing work withdrawal. "I experienced all the typical symptoms of sadness, uselessness, inability to enjoy anything and wanting to isolate myself in my bedroom. All I wanted to do was sleep all day and 'disappear'. Statistics show that December is a highrisk period for suicide so if you recognise these signs in a friend or loved one at any time of the year, encourage them to start talking about their depression. You can also contact the SADAG Suicide Crisis toll-free on 0800 12 13 14 for advice or assistance. Talking or joking about suicide. Feelings of hopelessness, guilt, selfblame and failure, loss of interest in activities they used to enjoy and withdrawal from friends and family. Preparing for death such as giving favourite things away or even saying goodbye. Changes in personality - someone who is usually sociable, may not want to go out, may become negative, aggressive or irritable etc. Loss of interest in appearance. Willingness to take risks. Suddenly feel better - without receiving treatment. TIME TO UNWIND, CATCH UP WITH family and friends, and celebrate the year that was and the one to come... These are just some of the reasons why many people can't wait for December. But it isn't the case for everyone. The summer holidays can also be a stressful, depressing time, especially for those who have been diagnosed with depression. This mental disorder is characterised by persistent sadness, loss of interest or pleasure in things that used to be enjoyable, and feelings of guilt, low self-worth and hopelessness. It also often comes with disturbed sleep or appetite, tiredness and poor concentration. Endless family gatherings, predictable arguments and unrealistic holiday expectations can all make it difficult to cope during December. 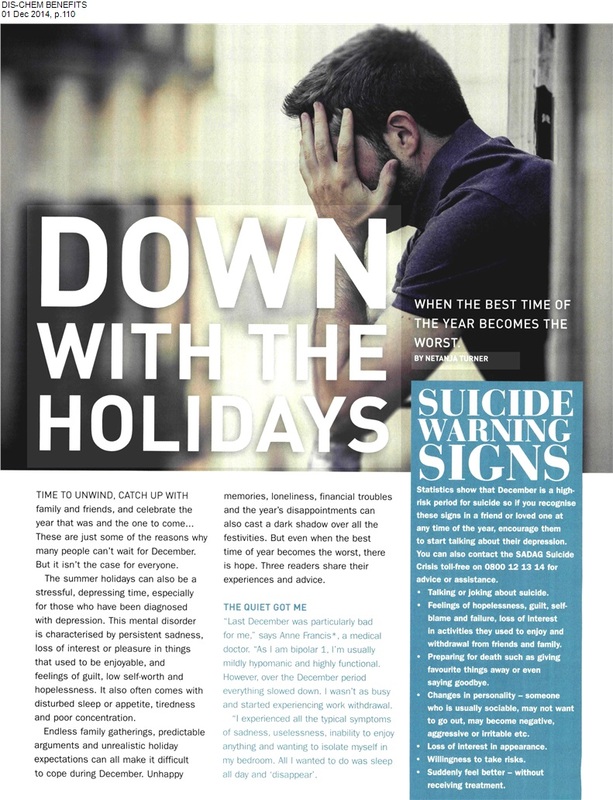 Unhappy Whether you have been diagnosed with depression or just feel a bit stressed, the South African Depression and Anxiety Group (SADAG) shares these 10 tips to get you through the holiday season: Lean on your support system (your network of close friends and family) when things get tough. Ask for help and be specific. People are usually happy to help if you tell them what you need. Don't stay longer than you want. Going to a party doesn't obligate you to stay until the bitter end. Knowing you have a plan to leave can really ease your anxiety. Have realistic expectations - the perfect holiday season doesn't exist. Don't stress about finding the absolute best gift ever. Draw up a budget before you start shopping and stick to it. As much as you possibly can, try to maintain your normal routine during the holidays. Don't rely on substances. Abusing them will make you feel worse. If you take medication for depression, don't miss doses. Take a time-out from family arguments, simmering feuds, and unhappy relationships - even if just temporarily. Be aware of your breaking points - and take a break when you get close to them. "I know and understand my condition well, so I avoided stressors, things that made me anxious. I avoided committing myself to get-togethers and parties. As I'm open about my condition, I would just say I wasn't well enough to go out or have guests over etc. I spent my time in a safe space - my home. I didn't go out at night as that makes me anxious. I limited the people that came to visit to my closest relatives and for short periods of time." My advice "Surround yourself with people who are sensitive to your mood and won't force you to hang out with strangers. Avoid talkative people, they tire you out. Find a safe place - your bedroom, the garden and spend time there - but let your family know where you are. If you feel particularly rotten, and don't feel like washing your hair - don't. Give yourself the space to cry into your pillow, and not brush your teeth etc. for no more than two days. Then no matter how hard it is, start taking care of yourself again, eating and get fresh air." ALL I COULD THINK ABOUT WAS OUR FINANCES "At my company, we all had to cut back on hours, because of the economic situation. 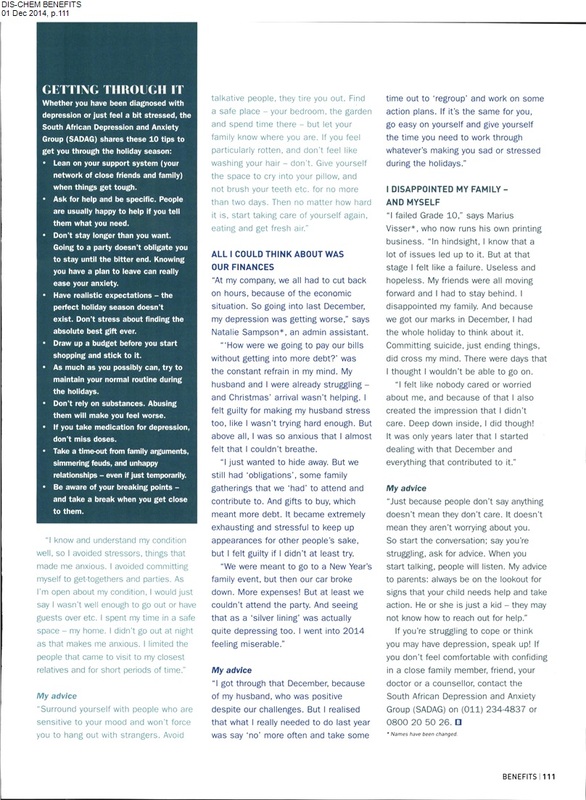 So going into last December, my depression was getting worse," says Natalie Sampson*, an admin assistant. "How were we going to pay our bills without getting into more debt?' was the constant refrain in my mind. My husband and I were already struggling - and Christmas' arrival wasn't helping. I felt guilty for making my husband stress too, like I wasn't trying hard enough. But above all, I was so anxious that I almost felt that I couldn't breathe. "I just wanted to hide away. But we still had 'obligations', some family gatherings that we 'had' to attend and contribute to. And gifts to buy, which meant more debt. It became extremely exhausting and stressful to keep up appearances for other people's sake, but I felt guilty if I didn't at least try. "We were meant to go to a New Year's family event, but then our car broke down. More expenses! But at least we couldn't attend the party. And seeing that as a 'silver lining' was actually quite depressing too. I went into 2014 feeling miserable." My advice "I got through that December, because of my husband, who was positive despite our challenges. But I realised that what I really needed to do last year was say 'no' more often and take some time out to 'regroup' and work on some action plans. If it's the same for you, go easy on yourself and give yourself the time you need to work through whatever's making you sad or stressed during the holidays." I DISAPPOINTED MY FAMILY - AND MYSELF "I failed Grade 10," says Marius Visser*, who now runs his own printing business. "In hindsight, I know that a lot of issues led up to it. But at that stage I felt like a failure. Useless and hopeless. My friends were all moving forward and I had to stay behind. I disappointed my family. And because we got our marks in December, I had the whole holiday to think about it. Committing suicide, just ending things, did cross my mind. There were days that I thought I wouldn't be able to go on. "I felt like nobody cared or worried about me, and because of that I also created the impression that I didn't care. Deep down inside, I did though! It was only years later that I started dealing with that December and everything that contributed to it." My advice "Just because people don't say anything doesn't mean they don't care. It doesn't mean they aren't worrying about you. So start the conversation; say you're struggling, ask for advice. When you start talking, people will listen. My advice to parents: always be on the lookout for signs that your child needs help and take action. He or she is just a kid - they may not know how to reach out for help." If you're struggling to cope or think you may have depression, speak up! If you don't feel comfortable with confiding in a close family member, friend, your doctor or a counsellor, contact the South African Depression and Anxiety Group (SADAG) on (011) 234-4837 or 0800 20 50 26. 13 Names have been changed.